Our Professional Genealogy Research and History Books, as Featured in the Local and National Media. Heir Line regularly appear in the local and national press. There are some examples below. The Daily Express, 28th August 2014. 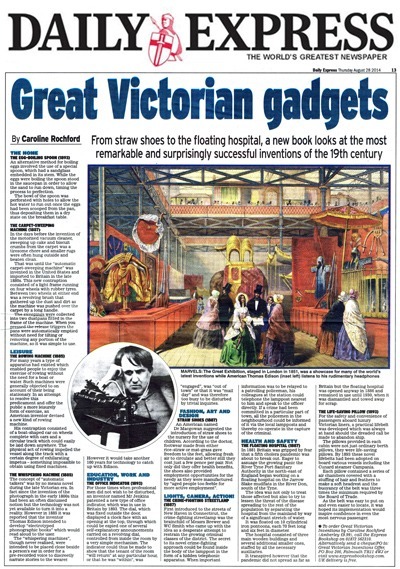 From straw shoes to the floating hospital, this full-page feature takes a look at Heir Line’s first history book, Great Victorian Inventions. It certainly highlights some of the most remarkable and surprisingly successful gadgets of the 19th century! The Daily Mail Online, 1st November 2014. 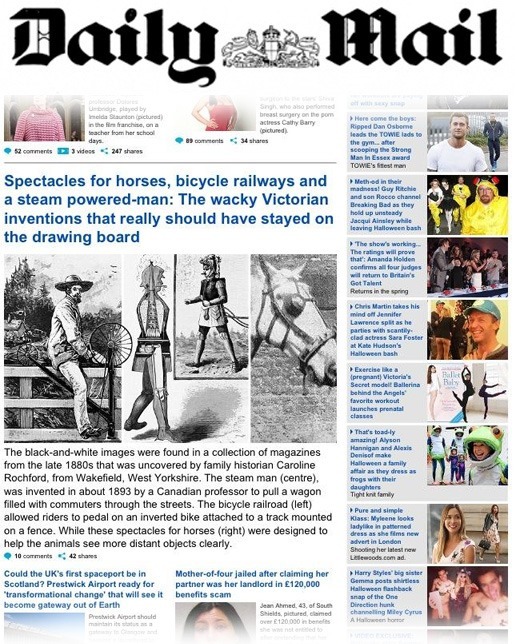 A feature all about Caroline Rochford's first book, Great Victorian Inventions. This piece attracted lots of comments and excitement, and additionally was a number one best seller on Amazon. The Daily Express, 16th April 2015. A feature about Caroline Rochford’s latest book, Great Victorian Discoveries. Firstly, this article discusses the dog that could read; secondly how to keep warm at night by wearing newspapers; the invention of the 24-hour clock; the remedy for asthma, and finally many other bizarre and brilliant Victorian notions. The Daily Mail Online, 1st May 2015. This article features a tongue-in-cheek look at another of Caroline Rochford's quirky history books, Great Victorian Discoveries. The article discusses some of the most bizarre theories and noteworthy discoveries from the late 19th century. 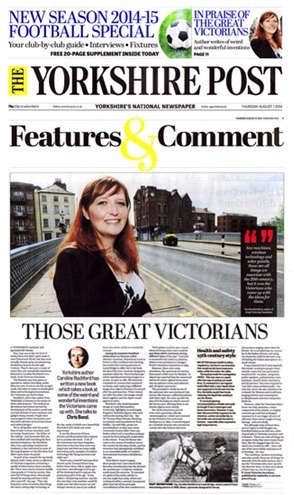 The Yorkshire Post, 7th August 2014. A full page feature about the weird and wonderful Victorian inventions from Yorkshire author Caroline Rochford’s first non-fiction history book, “Great Victorian Inventions: Novel Contrivances & Industrial Revolutions”. Fax machines, wireless technology and solar panels are all things we probably associate with the 20th century, but it was the Victorians who came up with these ideas first. 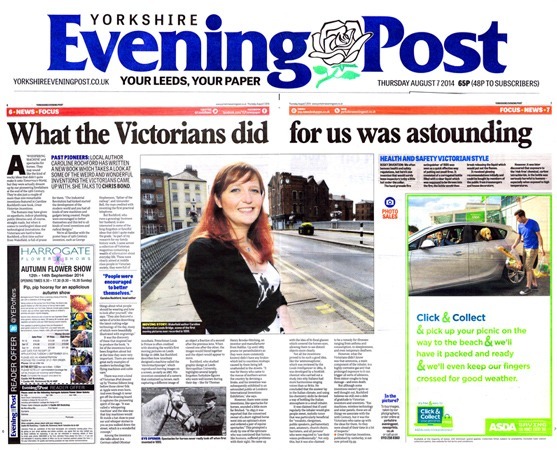 Above: The Yorkshire Evening Post, 7th August 2014. What the Victorians did for us was astounding! A double-page spread thus discusses horse spectacles, astronomy tools, and Italian climate inhalers (designed to improve one’s singing voice) that were dreamed up by the imaginative Victorians. These and many more astonishing technological revelations are therefore featured in Heir Line’s first history book, Great Victorian Inventions. It is written by Yorkshire author, Caroline Rochford. She is seen on Leeds Bridge, where history was made in 1888 by Louis le Prince, the photographer who captured some of the earliest known moving images. 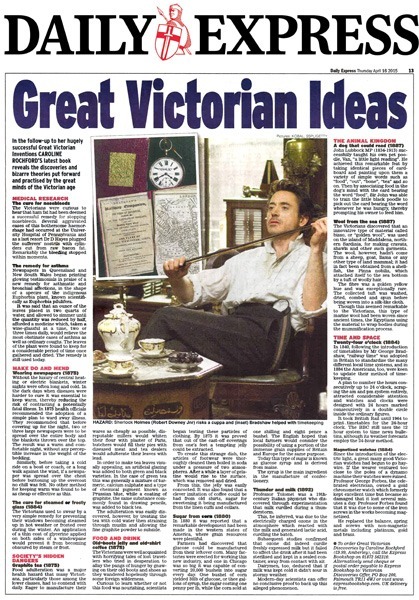 The Yorkshire Post, 14th October 2011, by Sheron Boyle. 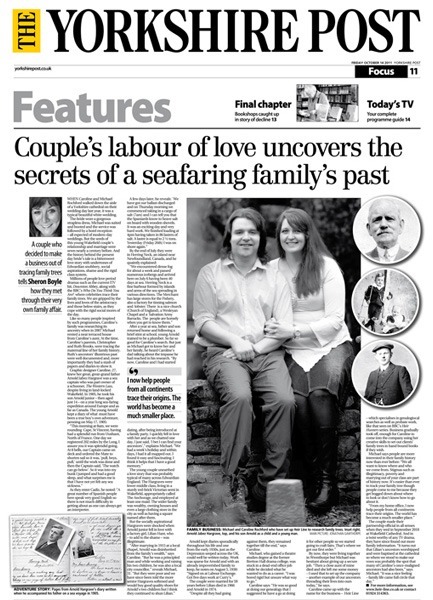 The seafaring story about how Michael and Caroline Rochford thus became professional genealogists and hence set up Heir Line, after Michael's discovery of master mariners from Newton Hill and Knottingley in Caroline’s 19th century family history. The Blackpool Gazette, April 2018. 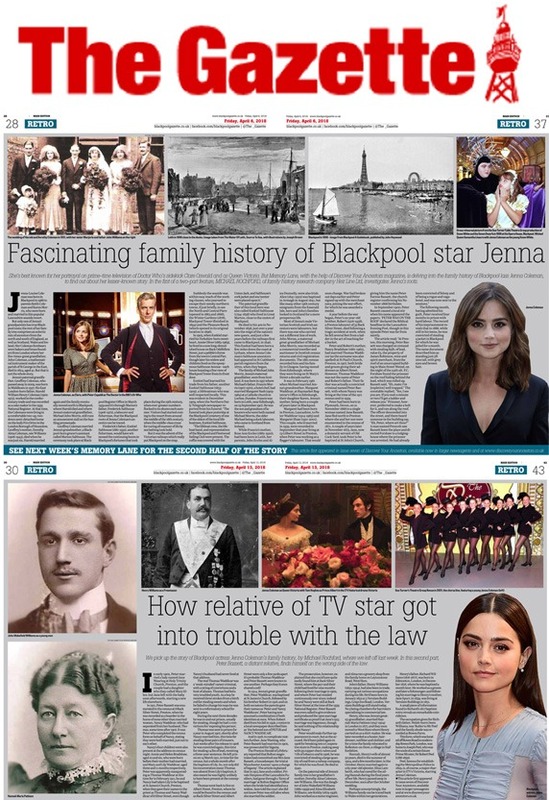 Our friends at this local newspaper writing about Michael J. Rochford's celebrity genealogy series in Discover Your Ancestors magazine, about the amazing history of TV star Jenna Coleman. Part 1 of the story tells how some of her ancestors were local heroes, saving lives with the Blackpool lifeboat crews, whilst others were bumbling criminals who duly went to prison. Certainly a fascinating story. Part 2 of the saga charts bigamy, theft, lies and intrigue throughout the family tree. Finally it discusses Jenna's ancestor, Owen Williams, the butler of Sir Robert Peel's uncle. Peel, famous for establishing the Metropolitan Police in 1829, is, of course, a major character in ITV’s Victoria, starring Jenna Coleman. A most noteworthy connection! The Teesdale Mercury, 9th January 2013. Heir Line’s family history research takes a surprisingly dark turn upon the discovery of a client’s ancestor who was perhaps a real-life Wackford Squeers! Did he maye inspire Charles Dickens, when writing his novel, Nicholas Nickleby? 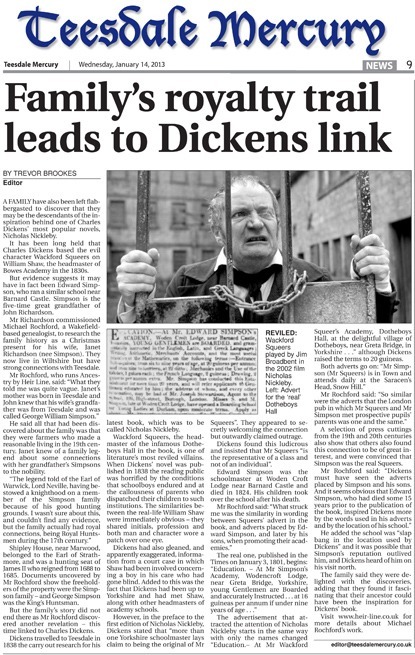 The story was also featured in The Northern Echo, on 2nd January 2013. 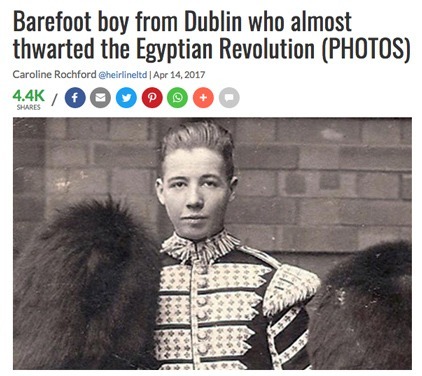 This American/Irish news website's feature on Caroline Rochford’s amazing true story about a barefoot boy from Dublin who almost thwarted the Egyptian Revolution of 1952. 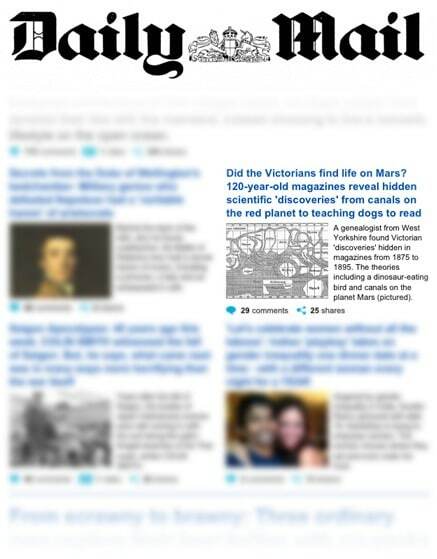 Certainly a popular story, it was thus shared via social media more than 4,000 times! 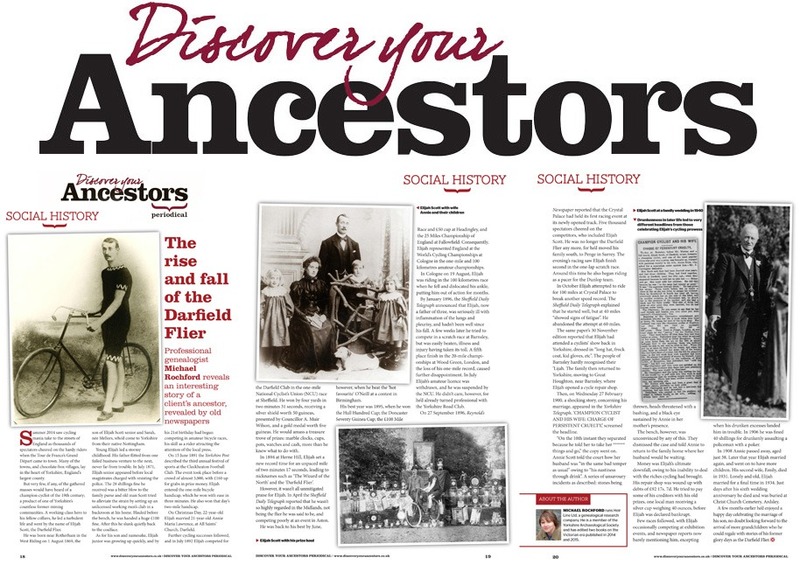 Above: Discover Your Ancestors, January 2015. Michael J. Rochford writes about one of his client’s fascinating ancestors, known to history as The Darfield Flier. Did you think the Tour De France was full of drama? Our modern cyclists pale into insignificance compared to this cycling champion of the 19th century! Unquestionably a pioneer of early track sport. Family Tree Magazine, Christmas 2014. 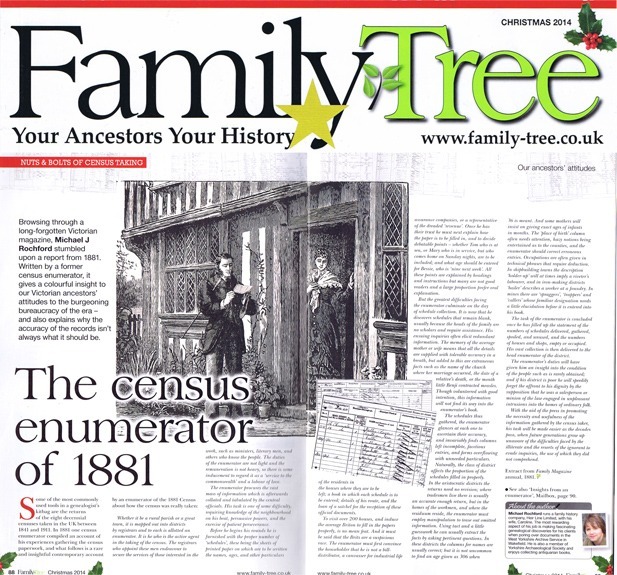 An altogether fascinating and in-depth article by family historian Michael Rochford about how the Victorian enumerators compiled the census of 1881. The Wakefield Express, Friday 18th November 2011. Heir Line’s historian, Michael J. Rochford, discovered evidence that forgotten medieval subterranean tunnels once existed far below the historic streets of Wakefield. Are there secret passageways, adjoining cellars underneath the old buildings, or conversely just a myth? The Wakefield Express, Friday 25th November 2011. A story about the birth of Heir Line when Michael and Caroline Rochford began researching Caroline's own family tree. Published in the ‘What Women Want’ magazine feature. Above: The Tuam Herald, Wednesday 15th April 2015. Sheron Boyle writes about her family history. She explains how Michael Rochford helped to uncover a fascinating story about her Irish grandmother who almost boarded the Titanic! Above: The Independent on Sunday, 17th August 2014. 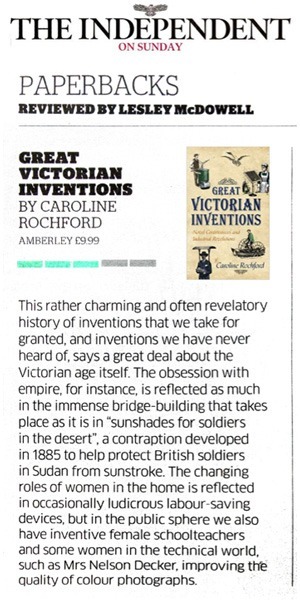 Paperback review by Lesley McDowell, who described Caroline Rochford’s Great Victorian Inventions as charming and revelatory. Above: A great review of Michael J. Rochford’s local history title, “Wakefield Then & Now: Extraordinary Tales from the Merrie City”, by Who Do You Think You Are? Magazine, November 2016. The magazine says the lively, fascinating and intriguing book “has it all”. Above: Your Family Tree Magazine, November 2014. A Q&A with Caroline Rochford, discussing her first illustrated history book, Great Victorian Inventions, and the inspiration behind it. Below that is a glowing review, describing the eclectic mix of 19th century designs ranging from the slightly bizarre to the downright brilliant. Complete with a family tree seal of approval! 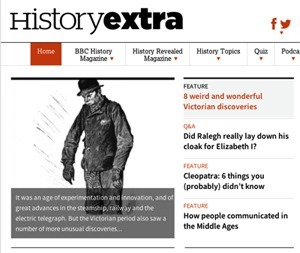 Above: BBC History Extra (online magazine), 29th April 2015. It was an age of experimentation and innovation, when the steamship, the telephone and the camera were born. But the Victorian period also saw a number of more unusual discoveries. In her new book, Great Victorian Discoveries: Astounding Revelations and Misguided Assumptions, Caroline Rochford examines some of the incredible findings made across the world between 1875 and 1895. 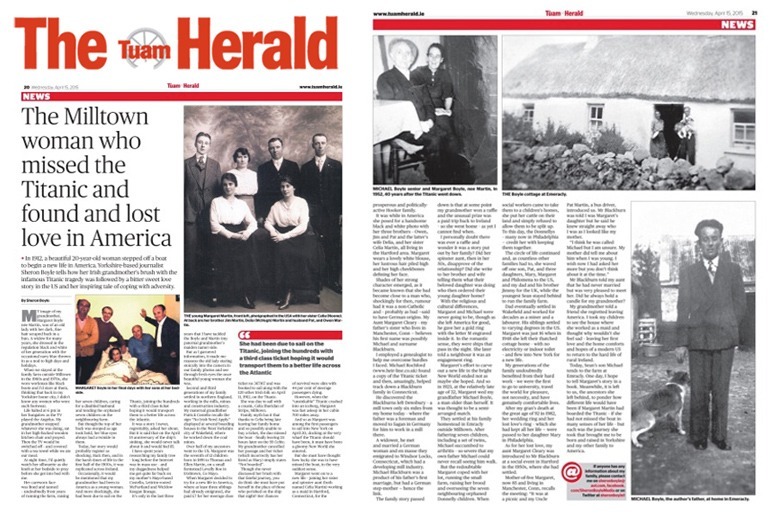 Above: Kincardineshire Observer, 2nd September 2014. 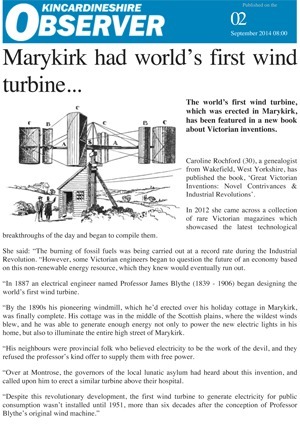 The world’s first wind turbine was designed and installed in Marykirk, Scotland, by the electrical engineer, Professor James Blyth. This was just one of many pioneering and revolutionary breakthroughs described in Great Victorian Inventions. 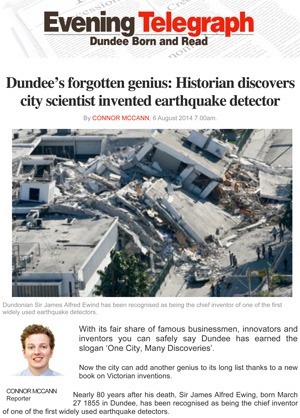 Above: Dundee’s Evening Telegraph, 6th August 2014. A feature about Sir James Alfred Ewing, the Scottish inventor of the ingenious earthquake detector – just one of the hundreds of 19th century marvels that appear in Heir Line’s first history book about Great Victorian Inventions. Above: The Barnsley Chronicle, 12th August 2014. 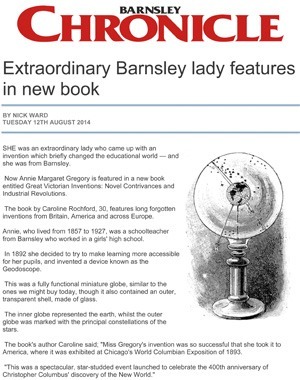 Miss Annie Gregory was a Yorkshire inventor who designed and created the geodoscope, a remarkable globe which she used to teach her school children astronomy. In an age before women were even allowed to vote, this must have been a huge achievement for her. Read all about Miss Gregory’s machine and many more innovative ideas in the fascinating book, Great Victorian Inventions. Above: The Lancashire Evening Post, 30th November 2016. A piece about Caroline Rochford’s maritime history book, Forgotten Songs and Stories of the Sea, published by Pen & Sword. 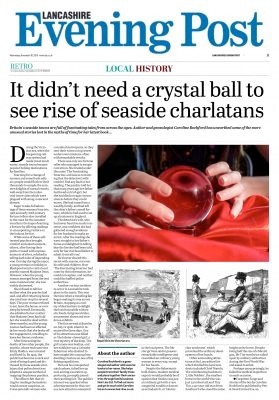 The article focuses on the tale of seaside fortune tellers who flocked to the Lancashire seaside during the late 19th and early 20th centuries. Though some were deemed charlatans, others completely mystified their sitters, much to the bewilderment of the local police force who’d been tasked with weeding out the fraudsters from the genuine psychics. Above: Sea Breezes, November 2017. 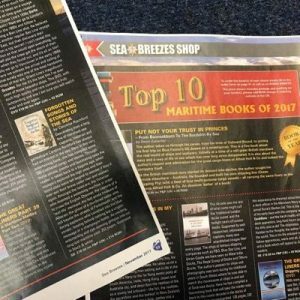 Caroline Rochford’s Forgotten Songs and Stories of the Sea was named as one of the magazine’s top 10 maritime books of 2017! 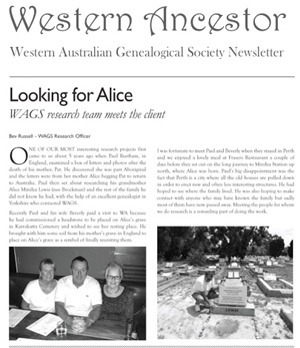 Above: The Western Australian Genealogical Society’s newsletter, Western Ancestor, March 2016. Bev Russell, WAGS Research Officer, writes about one of Heir Line’s most intriguing family history cases. Paul Beetham, a Yorkshire businessman, sought the help of Michael Rochford to help trace the ancestry of his late grandmother, Alice Brockman. A truly inspiring tale! 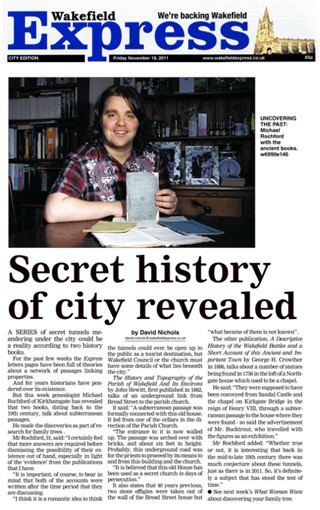 Above: The Wakefield Express, 26th October 2012 – a Halloween special. Heir Line discovered a terrifying tale about witchcraft in the 17th century. A Wakefield “witch” named Margaret Morton was put on trial after she put a curse on some Kirkthorpe and Warmfield townsfolk. But she wasn’t the only Yorkshire witch at work – Jennet and George Benton were also accused of devilry, when Richard Jackson of Bunny Hill Farm, Sharlston, experienced terrible goings-on in the dead of night! 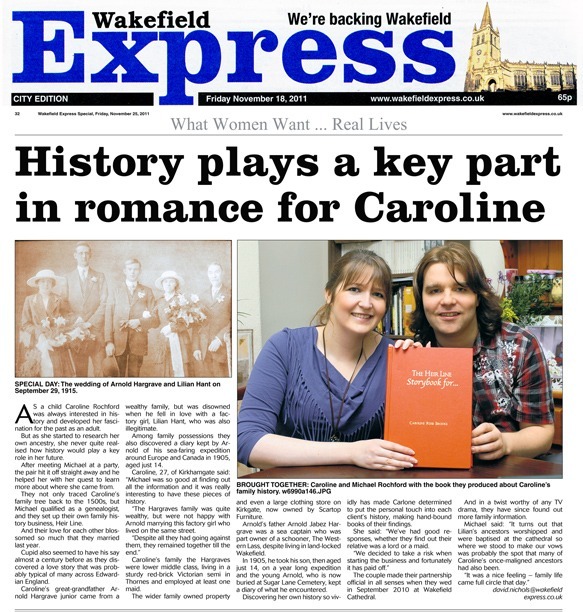 Above: The Wakefield Express – Friday 13th January 2012. Heir Line was chosen to be one of the finalists in the Local Business Accelerators competition, and was required to take part in a “Dragon’s Den” style pitch to a panel of three judges. We were delighted to receive a session of business mentoring from Sir Rodney Walker as a result of our pitch. Above: Taxi-Today Magazine, January 2012. An article by Michael J. Rochford about a Victorian cab driver driver from 1844.